The Padmavati trailer is out and here is my very first thought – it should be illegal for something / someone to look this good! Whether it is the opulent sets with the right fit in terms of earthy elements, or the sheer good looks of Deepika Padukone as Rani Padmavati – the good looks factor literally overpowers the senses and draws you in. The trailer shows highly stylised sets where tons of research must have no doubt, formed the very backbone of the proceedings and the settings. The Rajput side of things have just the right balance of all things opulent and all things elegant. A certain subtle quality marks the setting here and the brilliance shines through with muted colors and antiquated brocade that plays peekaboo. If nothing else, the Padmavati trailer is a study in how to create a well worn look of opulence, tapered with an almost modest approach when it comes to tapestry and ethnic art work. I am loving it! Sindoori red and pastels rub shoulders in never seen before combinations while the scale of the structures and the omnipresent glow of diyas, do the rest of the talking. And that brings us to the other side of the Padmavati trailer. Crossover from the beauty and meet the beast. Ranveer Singh’s Khilji almost revels in his dark Hagrid like surroundings. Trapped birds and dusty drapes mark the sets in this side of town, while the color black is represented in myriad hues, making way for the evil to really rock his horns and dance to the party beats of the dark and unknown. Dust, smoke, fog and low lighting make this setting a believably scary one. While we are on scary, how can we not mention Ranveer Singh’s look? 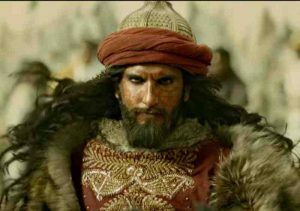 As Khilji, his hair and scar ensure that you are at once taken aback and riveted. His snarl infused presence and the fact that he talks with an evil arch of the eyebrow is what makes this a much awaited character, gloom and fear dripping from his every his expression. His cannabalised actions whether he is waging war, looking at his own image in the mirror or eating a meal, make for a Khilji that many textbooks would not have been able to reasonably cover. We cannot wait to see how his Khilji meets the delicate grace of Deepika’s Padmavati – a match no doubt made in cinematic heaven; a battle of wits and extremities like none other! The Padmavati trailer is held together by the ethereal yet earthy presence of the awe inspiring Deepika Padukone. She literally breathes life into the opulent structures and ensures that you will be waiting with bated breath for her character to set hearts and minds alike, on fire. From Pista greens to maroons; from a simple plait and Maangtika to graphic, antique artisan jewellery – she has carried off each and every look like it is an everyday thing for her to be playing a queen. Her gaze rises and meets the eye unlike most limpid eye princesses we have seen on screen before – a welcome change for a princess and one that adds warrior to princess instantly. Here she claims to be fighting with her Kangan, her sense of honour bestowed upon her by her marriage, rather than a sword wielded by her delicate wrists. This again is a welcome and empowering move by the film maker – a princess comfortable in her feminine role, what more could one have asked for? And in her Ratan Singh by Shahid Kapoor, one hopes to find a stoic yet smitten partner, as promised by the bearded and well turned out character sharing screen space with her. 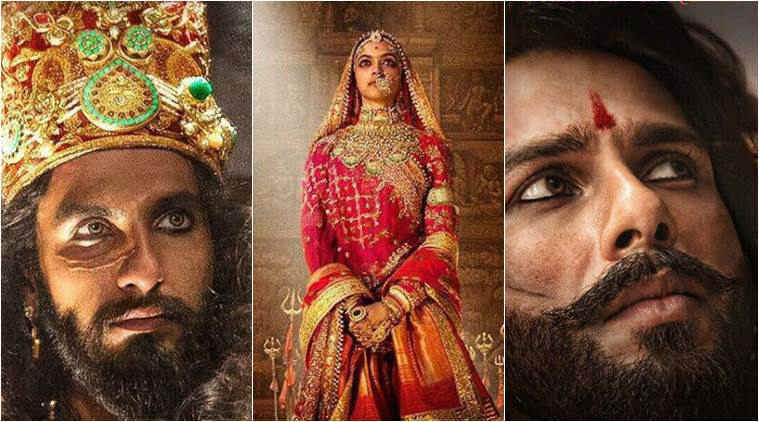 The Padmavati trailer could not have dropped at a better time – Diwali is just around the corner. And there will no doubt, be a heavy influence of velvety fabrics and brocade trimmed pieces doing the rounds in decor stores and fashion collections. In fact, Tanishq has already launched a collection as seen on screens! In the meantime, I am waiting for the 1st of December to watch this movie!